WSNS-TV, virtual channel 44 (UHF digital channel 29), is a Telemundo owned-and-operated television station licensed to Chicago, Illinois, United States. The station is owned by the NBC Owned Television Stations subsidiary of NBCUniversal, as part of a duopoly with NBC owned-and-operated station WMAQ-TV (channel 5); NBCUniversal, a Comcast subsidiary, owns both networks, along with regional sports network NBC Sports Chicago. WSNS-TV and WMAQ-TV share studio facilities and business offices at the NBC Tower on North Columbus Drive in the city's Streeterville neighborhood, and transmitter facilities atop the Willis Tower on South Wacker Drive in the Chicago Loop. The station first signed on the air on April 5, 1970, as an independent station; it is currently the third-oldest commercial television station on the UHF band in the Chicago market (behind WCIU-TV (channel 26), which signed on in February 1964; and WFLD (channel 32), which signed on in January 1966). WSNS was originally owned by a joint venture consisting of Harriscope Broadcasting (owned by Irving Harris, which owned a 50% interest), the Essaness Television Corporation (founded by theater owner Edwin Silverman), from which the station's call letters are derived, and National Subscription Television, a joint venture between Oak Industries (a manufacturer of satellite and pay television decoders and equipment) and Chartwell Enterprises (owned by media executive A. Jerrold Perenchio). The station's transmitter and studio facilities were located on the 97th floor of the John Hancock Center on North Michigan Avenue in the Streeterville neighborhood. The station never disclosed its ownership, in any of WSNS' formats, during regular sign-ons or sign-offs. Initially, channel 44 maintained an all-news programming format. During the daytime, the station aired an alphanumeric feed of news reports supplied from various wire services set to continuous elevator music, with a commercial banner placed on the lower third of the screen displaying advertisements for businesses such as Continental Bank, Jewel Foods and other clients. Every seven minutes, a four-sided board would be rotated—which was taped live on-camera—to display news headlines, traffic reports, sports scores and birthdays of notable celebrities and other personalities. On November 16, 1970, the station moved into a newly constructed studio facility on West Grant Place in the Lincoln Park community's Mid-North District. During these early years, the Emergency Broadcast System required many stations to shut down in the event of a national emergency. On February 20, 1971, when a National Level EBS message was accidentally activated, WSNS was the only television station to respond correctly and shut down. The all-news format was not particularly successful, and by 1972, WSNS had converted into an entertainment-based independent, running a low-budget general entertainment schedule. Basically, WSNS was the "also ran" independent station in the market, running whatever programming that established independents, WGN-TV and WFLD (now a Fox owned-and-operated station), declined to purchase the local rights to. The lineup included some Japanese animated and adventure series (such as Prince Planet, Ultraman, Marine Boy and The Space Giants), along with low-budget cartoons, older off-network shows, older feature films, and religious programming. WSNS did incorporate a few stronger programs within its schedule (among them, I Love Lucy, The Munsters, Leave It To Beaver and Gomer Pyle USMC); for a time during the mid-1970s, it also carried a local early-1960s-era showcase of Popeye cartoons hosted by Steve Hart. During the late 1970s, the station had also aired talk shows such as The Merv Griffin Show, The Mike Douglas Show, and Dinah! In addition, WSNS featured Chicago White Sox baseball games for seven years as well as showing Chicago Blackhawks hockey. By the early 1980s, the station had lost some of its higher-profile shows (such as I Love Lucy) to competitors such as WFLD. With the station stuck near the bottom of the ratings, WSNS looked at various options to become more viable. One such option was to acquire additional movie rights and drama series, and focus on more adult fare in the manner of what fellow independents WOR-TV (now WWOR-TV) in New York City and KTLA in Los Angeles were carrying at the time. However, the station was approached by National Subscription Television, a subsidiary of Oak Industries, about purchasing time on the station to broadcast a planned over-the-air subscription service called ONTV. Following an effort by the Federal Communications Commission (FCC) to promote alternative programming efforts on the UHF broadcasting spectrum, such as subscription television services, WSNS filed for and received one of the many subscription television licenses awarded in the United States, 32 of which went into use at one point. The station then began carrying programming from the new ONTV service. During the late 1970s and early 1980s, most major cities had one or two licensed subscription television operators. To obtain a subscription television license, the station had to provide the FCC with a proposal detailing the programming to be offered (usually first-run movies, children's shows during the morning hours and late-night adult entertainment, much like those offered by cable-originated pay services such as HBO or Showtime). The station required subscribers to have a descrambler installed in their home in order to unscramble the station's signal during ONTV's programming hours. National Subscription Television subsequently purchased a 24.5% interest in the station from Essaness Television Corporation. In September 1980, WSNS continued to maintain a general entertainment programming format until 7:00 p.m. on weekdays and on weekends until 5:00 p.m., with ONTV occupying the remaining time periods. In November 1981, WSNS extended its transmission of ONTV programming by one hour on weekdays (now starting at 6:00 p.m.) and by three hours on weekends (to 12:00 p.m.). By January 1982, WSNS began carrying ONTV for 20 hours per day, with an hour of public service programming (which also was listed as part of ONTV's schedule, though was not mentioned in other listings publications such as TV Guide) in order to fulfill FCC requirements for television stations offering a subscription service to broadcast at least 20 hours of unencrypted programming per week. In January 1983, after the FCC repealed the unencrypted programming requirements the previous fall, WSNS began carrying ONTV programming on a 24-hour basis, with the station's signal being scrambled the entire time. During one of the station's license renewal periods in 1982, Monroe Communications Corporation, a group owned by twelve Chicago-area investors, filed a motion with the FCC to contest the license for WSNS, arguing that a television station should not be allowed to use the public airwaves for a subscription fee nor should the airwaves be used to carry indecent content; this case was ultimately settled. The ONTV Chicago service ceased operations in July 1985, largely due to the long-awaited entrance of cable television service into the area. Chicago was the last market where ONTV ended service as a result of protracted debates by the Chicago City Council over how to divide the market for cable distribution in order to avoid a single provider monopolizing service. However, WSNS was hit with additional lawsuits regarding the softcore pornographic films aired on ONTV, challenges that continued shortly after the service's shutdown. In addition, in February of that year, administrative law judge Joseph Chachkin ruled in favor of Monroe Communications in its effort to strip the Essaness/Harriscope/National Subscription Television venture of the WSNS license. Video 44, Inc. (the licensee operated by Essaness and Harriscope) appealed the ruling, which resulted in a stay of the judge's order. By 1985, WSNS decided the subscription format was not commercially viable, at a time when cable television providers were beginning to enter into the Chicago market. On July 1 of that year, after signing a three-year affiliation agreement with the network, the station became a full-time affiliate of the Spanish International Network—which became Univision the following year. WSNS displaced WCIU-TV (channel 26) as the market's SIN affiliate; that station ran the network's programming daily after 5:00 p.m. and the English language Stock Market Observer business news block during the daytime hours; WCIU then affiliated with NetSpan (which would become Telemundo in 1987). On October 13, 1988, WSNS-TV announced that it would switch its affiliation to Telemundo after that station's affiliation agreement with Univision concluded on December 31; two months later on December 16, WCIU—whose contract with Telemundo was set to expire the following month—signed an affiliation agreement with Univision, returning the station to that network after four years. The two stations switched affiliations on January 10, 1989. Monroe Communications' attempts to have the WSNS license revoked from the Essaness-Harriscope venture's possession continued into the early 1990s. In April 1990, a federal appeals court in Washington, D.C. overturned the FCC's 1989 decision to renew Video 44's license to operate WSNS, stating that the agency acted "arbitrarily and capriciously" in granting it, partly due to it having "improperly refused to consider evidence of obscene broadcasts" by the station in the early 1980s, requiring the Commission to conduct further proceedings in the dispute. On September 19, 1990, the FCC denied Video 44's application to renew its license; the ruling was upheld on appeal weeks later in a 5-0 decision, and awarded a new construction permit to Monroe Communications; Video 44, Inc. subsequently appealed the decision. Although Monroe pledged to provide an expanded array of Hispanic programming aimed at Chicagoans of Mexican and Central American heritage should its license application be approved, several Hispanic aldermen on the Chicago City Council and other community leaders objected to the FCC's decision, expressing concern that the revocation would deprive Chicago's Hispanic community of a major voice. The FCC denied Video 44's appeal of the license revocation for a second time on July 25, 1991. The dispute between the Monroe and Essaness/Harriscope groups finally ended after eleven years in June 1993, when Monroe Communications reached an agreement with Harriscope to drop its case against Video 44, Inc., in an $18 million settlement awarded to Monroe by Harriscope Broadcasting. On November 9, 1995, Essaness sold a 74.5% controlling interest in the station to Telemundo for $44.7 million, with Essaness retaining a 25.5% stake. The move provided Telemundo with its first major-market owned-and-operated station and allowed Telemundo to establish itself as a viable Spanish language network against Univision. When NBC purchased Telemundo in 2002, WSNS became part of the newly enlarged conglomerate, creating Chicago's first commercial television duopoly between two full-power television stations. At that time, WSNS migrated from its longtime studio facility on West Grant Place and merged its operations with NBC owned-and-operated station WMAQ-TV (channel 5) at the NBC Tower on North Columbus Drive in the Magnificent Mile; the Grant Place building has since been demolished. The following year, NBC became the sole owner of WSNS when it bought out Essaness' stake in the partnership. On November 11, 2016, WMAQ-TV's president and general manager David Doebler was appointed as president and general manager of WSNS-TV. Doebler is succeeding its president and general manager Chris McDonnell who was hired by the station in 2012, becoming the second person in Chicago to become president and general manager of the duopoly stations (following Dennis Welsh of Fox-owned duopoly of WFLD/WPWR-TV) and the third NBC employee to become the president and general manager of their duopoly stations (following Rich Cerussi of the San Francisco Bay Area's duopoly stations of KNTV and KSTS and Ric Harris of Philadelphia's duopoly stations of WCAU and WWSI). WSNS-TV shut down its analog signal, over UHF channel 44, on June 12, 2009, the official date in which full-power television stations in the United States transitioned from analog to digital broadcasts under federal mandate. The station's digital signal continued to broadcast on its pre-transition UHF channel 45. Through the use of PSIP, digital television receivers display the station's virtual channel as its former UHF analog channel 44. WSNS-TV also relocated its main transmitter from the John Hancock Center to the Willis Tower. On April 13, 2017, station manager David Doebler revealed that the signals of WSNS-TV's over-the-air spectrum had been sold in the FCC's spectrum reallocation auction, fetching $141.7 million. WSNS-TV ceased broadcasting on UHF digital channel 45 on April 23, 2018, and began sharing spectrum with WMAQ-TV on channel 29. WSNS obtained the rights to broadcast Major League Baseball games involving the Chicago White Sox in 1973, assuming the rights from WFLD. During this period, the station's White Sox game telecasts were announced by play-by-play announcer Harry Caray. Beginning in 1977, Caray was joined in the broadcast booth by former Boston Red Sox outfielder Jimmy Piersall as color commentator. The games were produced under an outsourcing agreement between WSNS and WGN-TV, the latter of which produced the telecasts (Caray also appeared on WGN's newscasts as a sports anchor during the 1970s, and was therefore employed with that station). WSNS carried White Sox games through the 1980 season, after which the telecasts began airing exclusively on WGN-TV for the 1981 season, before it lost the Sox television rights to WFLD. WSNS was also the home of Bob Luce Wrestling, which occasionally featured guest appearances by longtime White Sox announcer Bob Elson to cross-promote the White Sox game telecast that followed the weekly wrestling matches. In 1972, WSNS aired the 1972 Summit Series via satellite, which featured the national hockey teams from Canada and the Soviet Union. WSNS also aired Chicago Bulls basketball games from 1973 to 1976, as well as WHA hockey games involving the Chicago Cougars from 1972 to 1975. From 1976 to 1980, channel 44 aired the NHL Game of the Week on Monday evenings; the station began airing road games featuring the Chicago Blackhawks from 1978 to 1980 (those games were also simulcast on WCFL (1000 AM, now WMVP), which was the Blackhawks' local radio broadcaster at the time). WSNS was the last broadcast television station in the market to air Blackhawks games until the 2008-09 season, when WGN-TV acquired the rights to broadcast the team's games. During the 1970s, WSNS aired college basketball games featuring the Purdue Boilermakers, the Indiana Hoosiers, and–in the late 1970s–the DePaul Blue Demons. Through their five-year broadcast partnership with its sister station WMAQ-TV and the team, WSNS aired the Spanish language broadcasts of the preseason games of the Chicago Bears football team from 2003 to 2007. On June 15, 2017, station president David Doebler announced that WSNS will broadcast the Chicago Marathon in Spanish beginning with the 40th anniversary of the running of the marathon on October 8, 2017; this comes following the announcement the Bank of America Chicago Marathon and WSNS signed their contract to air this event. As a result, sister station WMAQ-TV announced they will extend their partnership with the Bank of America Chicago Marathon and the Bank of America Shamrock Shuffle 8K and will continue to air both events in English across all station platforms on the main station, its Cozi TV subchannel and the station's website. WSNS-TV presently broadcasts 10 hours of locally produced newscasts each week (with a half-hour each weekday); in addition, the station produces Enfoque Chicago, a local version of Telemundo's political discussion program Enfoque, which airs Saturday evenings at 4:30 p.m. and Acceso Total, a locally produced entertainment and lifestyle program, which airs Fridays and Mondays at 10:30 a.m., and Sundays at 4:30 and 10:30 p.m.
WSNS' newscasts have long placed second among the Chicago market's Spanish-language stations; however, the station has long maintained a fierce competition with Univision owned-and-operated station WGBO-DT for the highest-rated Spanish newscasts in the market. During the station's initial all-news format, the first program to be added was Underground News, a 10-minute program that premiered at 11:50 p.m. on July 1, 1970, when the Associated Press wire feed began incorporating local news stories. At that time, the banner ad on the lower third of the screen changed to feature an advertisement for Head Imports, with the program being set to music from progressive rock artists such as The Grateful Dead. Most of the stories featured on Underground News focused on the anti-war movement. With a staff consisting of local talent and a team of recent graduates from Southern Illinois University, the station went "live" during this time. One of the first live-on-tape programs to air was a reformatted Underground News, which was hosted, reported and co-produced by Chuck Collins, a 21-year-old recent political science studies graduate. Eventually, the rights to the program were purchased by Collins and Samuelsohn, who sold Underground News into syndication, where it aired in more than a dozen cities. Collins would go on to win seven Emmy Awards during his tenure at NBC News, two Peabody Awards, a Dupont Award and the American Bar Association's Silver Gavel Award (he died from nerve disease in July 2010). In order for WSNS to secure an advertising deal with a local mattress store, the station also launched a news program titled Heart of the News, which featured anchor Linda Fuoco reading the news in a provocative manner on a heart-shaped bed. That program was short-lived; however, the program's second anchor, Judith Wright, anticipated such current-day satirical news programs as The Daily Show, as she made funny and ironic commentaries on news stories culled from the AP wire during the day (Wright later moved to a second and naturally less-profile career as a Ph.D. biochemist, inventing a method of using fish bones to clean up heavy metal contamination in water and soil). After discontinuing the all-news format in 1972, WSNS would not broadcast news programming again until October 1985, after it became a Spanish International Network affiliate, when it launched a new news department and premiered Noticentro 44, a half-hour Spanish-language local newscast airing weeknights at 5:00 and 10:00 p.m., which were originally anchored by Enrique Gonzalez del Real and Roberta Nozicka, with reporting by David Cordova and Alberto Sillas. As the anchors and formats changed over the years, WSNS' prime objective was to produce professional and insightful newscasts comparable to any other local television news outlet in the Chicago market. In 2002, the station expanded its news coverage as part of Telemundo's strategic plans to revamp its owned-and-operated stations, including its sister stations in New York City, Los Angeles and Miami. On January 15, 2001, it launched a morning newscast called Buenos Días Chicago that aired from 6 to 7 a.m., but along with sister station KTMD in Houston, it was canceled after the September 11 attacks because of low advertising revenue. In 2005, WSNS' newscasts began to skyrocket in the ratings, earning some of their highest viewership in the history of the current news department. The newscasts, then anchored by Esmeralda Medellín and Vicente Serrano at 5:00 and 10:00 p.m., were retitled from Noticiero 44 to Noticiero Telemundo Chicago (in accordance with the station's adoption of the new "Telemundo Chicago" brand that de-emphasized references to its over-the-air placement on channel 44) and introduced a new graphics package based on that used by NBC O&O sister WNBC in New York City. In addition, as some of its fellow Telemundo O&Os had done, WSNS debuted an in-depth news/public affairs program titled En Contexto (In Context), which was anchored by Serrano. Later that year, Medellin left the station, while Serrano was laid off due to budget cuts imposed by the network; weather anchor Tsi-Tsi-Ki Félix was subsequently promoted to a news anchor position. In 2008, the station attempted to expand its news programming. It debuted Telemundo Chicago Por la Mañana, a mid-morning news program that replaced paid programming in its 10:30 a.m. timeslot, and was anchored by Felix, who added the program in addition to her existing solo anchor duties on the 5:00 p.m. newscast; Serrano remained host En Contexto as well. The station first launched a morning news program in 2007, after Alfonso Gutierrez joined WSNS, anchoring a five-minute weekday morning update titled En Vivo Por La Mañana at 5:55 a.m. In May 2009, Vicente Serrano was laid off by WSNS management due to financial constraints; the station subsequently announced that it would cancel Por la Manana and replace it with a new entertainment/lifestyle program Acceso Total that September, to be hosted by Nelly Carreño, who would also serve as weather anchor for the weeknight newscasts. At that time, Felix became an evening anchor full-time, helming the 10:00 p.m. newscast solo in addition to the 5:00 edition, becoming the first to regularly solo anchor a newscast in the history of the station's current news department. Felix gained a co-anchor in 2011, when Rolmàn Vergara joined the station as anchor of the vening newscasts. In November 2012, Felix and Vegara both left WSNS within a day of one another (the latter's departure came after having only been at the station for nine months), with Alfonso Gutierrez serving as interim anchor; Félix's departure was surprising, considering her popularity with viewers and the fact that she had been with WSNS in some on-air capacity since May 2001. In August 2013, Edna Schmidt (who previously reported for WGBO, before becoming a Chicago-based correspondent for Univision Noticias) was named co-anchor of the 5:00 and 10:00 p.m. newscasts, only to be fired by the station that October; Schmidt filed a lawsuit against the station in November of that year, claiming that WSNS and its corporate parent NBC Universal violated the Americans with Disabilities Act by failing to provide Schmidt "reasonable accommodation" for her alcoholism after she anchored the September 30, 2013 edition of the 10:00 p.m. newscast while intoxicated, leading to her suspension and later dismissal. On September 18, 2014, Telemundo announced that it would expand its early-evening newscast to one hour, with the addition of a half-hour program at 4:30 p.m., as part of a groupwide news expansion across Telemundo's O&Os. On December 19, 2014, Anabel Monge (former anchor at KWEX-TV in San Antonio) joined the station as co-anchor on the 5:00 and 10:00 p.m. newscasts, with fellow newcomer Marcella Vasquez joining as solo anchor of the 4:30 newscast; the station also implemented a revised version of the Telemundo O&O standardized graphics and introduced a new set for its newscasts, replacing one that had been in use since 2004. On June 29, 2015, WSNS launched a consumer investigative unit Telemundo Responde (the ninth such unit launched by Telemundo Station Group), reporting on local residents who have been victims of fraud, identity theft and scams; the unit is currently headed by chief investigative reporter Alba Mendiola, who joined the station as a general assignment reporter in 2001 and formerly hosted Enfoque Chicago. On September 26, 2016, WSNS expanded its 4:30 p.m. newscast to an hour, with an early half-hour extension at 4:00 p.m. replacing an older "best-of" episode of Caso Cerrado in that timeslot, making the first Spanish-language station in Chicago to have 90 minutes of local news every weekday, which competes with English-language 4:00 p.m. newscasts on rivals WLS-TV, WMAQ-TV and WGN-TV; this is a part of the expansions on its local newscasts around the Telemundo Station Group. On July 12, 2017, WSNS announced that it will begin its half-hour weekend evening newscasts at 5:00 p.m. and 10:00 p.m. beginning July 22; ironically, WSNS will be the second Spanish-language station in Chicago to expand its newscasts on weekends; rival WGBO-DT had begun expanding weekend newscasts in the time period. The 5:00 p.m. Saturday newscast will compete with the English-language 5:00 p.m. Saturday newscasts on rivals WLS-TV, WMAQ-TV and WBBM-TV, while the 5:00 p.m. Sunday newscast competes with the English-language 5:00 p.m. Sunday newscasts on rivals WLS-TV and WMAQ-TV and the 10:00 p.m. weekend newscasts will also compete with the English-language 10:00 p.m. weekend newscasts on WLS-TV, WMAQ-TV and WBBM-TV. On January 22, 2018, WSNS launched its midday newscast anchored by Irene Sanchez; it is the first Spanish-language station in Chicago to have midday newscasts. The new newscast was eventually followed by the national midday newscast Noticias Telemundo Mediodía which also premiered on the same day. ^ Charles Storch (September 13, 1985). "Obscenity Ruling Sought In WSNS License Battle". Chicago Tribune. Tribune Publishing. Retrieved September 10, 2015. ^ Sally Saville Hodge (February 23, 1985). "Owners Of Channel 44 In Danger Of Losing License". Chicago Tribune. Tribune Publishing. Retrieved September 10, 2015. ^ Charles Storch (October 14, 1988). "WSNS Switches To Telemundo From Univision". Chicago Tribune. Tribune Publishing. Retrieved September 8, 2015. ^ "Chicago's two major Hispanic television stations will..." Chicago Tribune. Tribune Publishing. December 16, 1988. Retrieved September 8, 2015. ^ James Warren (April 14, 1990). "Court Ruling To Test TV License Policy". Chicago Tribune. Tribune Publishing. Retrieved September 8, 2015. ^ Steven Morris (September 20, 1990). "FCC Denies WSNS-TV New Broadcast License". Chicago Tribune. Tribune Publishing. Retrieved September 8, 2015. ^ "WSNS Owners To Seek Reprieve From FCC". Chicago Tribune. Tribune Publishing. September 27, 1990. Retrieved September 10, 2015. ^ "The Tug-of-war Over Channel 44". Chicago Tribune. Tribune Publishing. May 15, 1991. Retrieved September 10, 2015. ^ "FCC Again Rules Against Channel 44 Owners". Chicago Tribune. Tribune Publishing. July 26, 1991. Retrieved September 10, 2015. ^ Robert Feder (June 15, 1993). "Channel 44 Settles 11-Year License War". Chicago Sun-Times. Knight Ridder. Archived from the original on April 9, 2016. Retrieved September 10, 2015 – via HighBeam Research. ^ Tim Jones (November 10, 1995). "WSNS-TV To Join Telemundo Show". Chicago Tribune. Tribune Publishing. Retrieved September 10, 2015. ^ Robert Feder (November 11, 2016). "NBC 5 boss David Doebler adds Telemundo station". RobertFeder.com. Retrieved November 12, 2016. ^ Malone, Michael (December 1, 2014). "Telemundo Station Group Launches TeleXitos Multicast Net". Broadcasting & Cable. Retrieved February 6, 2015. ^ "DTV Tentative Channel Designations for the First and the Second Rounds" (PDF). U.S. Federal Communications Commission. Archived from the original (PDF) on August 29, 2013. Retrieved March 24, 2012. ^ "NBC Makes Over $480 Million From Auction". TVNewsCheck. April 13, 2017. Retrieved April 13, 2017. ^ "Chicago Television Spotlite--Ed Morris". Chicago Television. ^ Michael Hirsley (February 13, 2007). "Bob Luce: 1928 - 2007 A promoter extraordinaire Staging pro wrestling shows was a labor of love for Bob Luce". Chicago Tribune. Tribune Broadcasting. ^ "Bank of America Chicago Marathon Extends Media Partnership with NBC 5 Chicago and Adds Telemundo Chicago". RunningUSA. June 15, 2017. Retrieved June 23, 2017. We are thrilled for NBC 5 and Telemundo Chicago to be the broadcast home of the Bank of America Chicago Marathon for the coming seasons. We are honored to serve our viewers by broadcasting this world-class race through 29 distinctive Chicago neighborhoods. ^ "Telemundo Chicago (WSNS) Premieres New Show: "Acceso Total"". PR Leap (Press release). September 18, 2009. Retrieved September 10, 2015. ^ "Changing Channels". Chicago Television. Museum of Broadcast Communications. ^ "Serrano no longer at Telemundo". Media Moves. May 6, 2009. ^ "Félix leaves Telemundo Chicago". Media Moves. November 14, 2012. ^ "Changes At Telemundo Chicago - Two News Anchors Exit". Chicagoland Radio and Media. November 26, 2012. Retrieved September 10, 2015. ^ "Vergara Out at Telemundo Chicago". Media Moves. November 15, 2012. ^ "Edna Schmidt Joins WSNS Chicago As Co-Anchor". TVNewsCheck. NewsCheck Media. July 29, 2013. Retrieved September 10, 2015. ^ "Edna Schmidt Exits Chicago TV Once Again". Chicagoland Radio and Media. November 1, 2013. Retrieved September 10, 2015. ^ Robert Feder (November 10, 2014). "Chicago anchor sues Telemundo over firing". Chicago Tribune. Tribune Publishing. Retrieved September 10, 2015. ^ "WSNS-TV Adds News Anchor & 30-Minute Newscast". Chicagoland Radio and Media. September 18, 2014. ^ Robert Feder (September 18, 2014). "New co-anchor called 'real win' for Telemundo Chicago". Chicago Tribune. Tribune Publishing. Retrieved September 10, 2015. ^ "WSNS Chicago Launches Consumer Unit". TVNewsCheck. NewsCheck Media. June 29, 2015. Retrieved September 10, 2015. ^ Robert Feder (June 29, 2015). 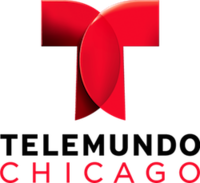 "Telemundo Chicago brings consumer advocate to the rescue". Chicago Tribune. Tribune Publishing. Retrieved September 10, 2015. ^ "Telemundo Chicago Launches Investigative Unit". Chicagoland Radio and Media. June 29, 2015. Retrieved September 10, 2015. ^ Robert Feder (July 12, 2017). "Robservations: Telemundo Chicago adds weekend newscasts". Daily Herald. Paddock Publications. Retrieved July 13, 2017.